The Nexus One, the phone I have been waiting 2.5 years for, has arrived at last. 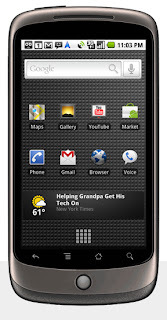 Yesterday Google, working with its partners, made the Nexus One 'super phone' available directly from the Google web site. It comes SIM and ROM unlocked, available either stand-alone or with a contract from an expanding list of carriers (currently T Mobile US). It's a platform for mobile innovation with an emphasis on simplicity -- for consumers and developers alike. In June of 2007, shortly after the iPhone release, I first ranted about the phone I really wanted. At the time I (like many others) termed it the gPhone - a device sold by Google, tightly integrated with the Google services that were a vital part of my life, and with a slick form factor and powerful development platform beneath it. By October of that year Google moved most of the services that were missing into the mobile cloud before the November release of the first preview Android SDK changed the mobile world (and mine). Full Webkit-based browsers on smartphones brought all the websites I needed direct to my phone, and Android provided an incredible platform on which to explore the development possibilities of a mobile extra-sensory device. In September of 2008 the G1 launched in the US for $180 with contract on T-Mobile, and we finally had hardware on which to run our Android applications. By December of 2009 nearly 20 different devices were available, in 48 countries and on 59 different carriers. Now, the Nexus One joins the Android menagerie, and a welcome addition it is. Having played with this device for a while, I can tell you it's easily the nicest phone I've had the pleasure of using. The screen is ridiculously clear and bright, the form factor has just the right balance between "sleek" and "robust", and Android 2.1 includes most of the stuff I've been hoping for since 1.0. This direct to consumer model is going to further increase the rate of mobile innovation -- for hardware, the Android platform, and apps. A year ago there was one Android phone and a handful of apps. Today there are 20 phones and 18,000 apps. Today we have our first Google Super Phone, tomorrow looks... exciting. I am certainly looking forward to buy one when it comes to Europe. Do you know approximately (first/second half 2010), when support for paid apps in Market will expand to more countries? At GDD Prague you said that expansion to more countries is top priority for the Market team... but why does it take so long? I'm in the UK, mine is due to arrive today!!! What is the latest on the phone. I heard there were some major issues with it with various carriers. And I cant seem to post a comment there. Also is it possible to use the code you have supplied to create a loop prog type app where audio is recorded from the mic and then played out the earpiece with only a 1 - 2 second delay? have you ever come across our service? DeviceAnywhere host about 2000 devices - and a growing subset of these are Android devices - for developers to remotely upload and test their apps. It's excellent to have a phone physically next to you but we help developers connect to more devices than anyone would want to buy. Just check out the website and get in touch if you like a free trial account.